Cozy Chicks: Is winter for the birds? Is winter for the birds? Little wren taking a break. We love to complain about the cold weather and yet most of us in northern climes get to live indoors, buy our food in a well-stocked grocery store and avoid flitting around dressed only in feathers. As a rule, we don’t need to eat a quarter to half our body weight daily just to have the energy to fly through our lives. But that’s the difference between us and our favorite birds. When I think about the brave little birds, it reminds me not to whine about small problems. 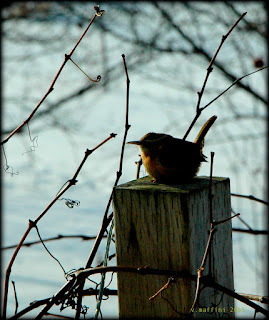 I thought you might enjoy some of Victoria Maffini's(half of Victoria Abbott) winter bird photos. Here in Eastern Ontario we are still having unusually mind weather, hovering above freezing, but we know what’s coming. Winter is just around the corner and even if it turns out to be ‘mild’ (pause for maniacal laughter), our feathered friends will be busy but they will still need help. 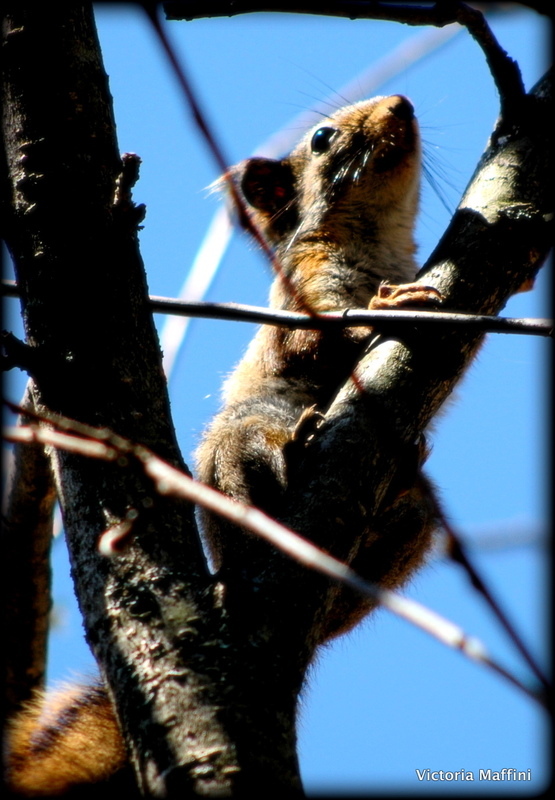 This is the time to put out your bird feeders if they’re not out yet. We like to see ours from our window. We’ve had the best luck with small cylinders for Nyjer seed and a larger cylinder with a weight sensitive bar that closes off the feeding holes if something heavy, say a squirrel or a jay, hops on. We use the red-roofed bird feeder for the cardinals and fill it with white safflower seed. Come and get it, Mr. and Mrs. C! Our cardinals love white safflower seed and squirrels are not supposed to care much for that. Several squirrels in our area did not get that memo. We like to put out suet as well, especially in the really cold weather. However, last year we spotted a black squirrel making off with the suit and the container as well! It gets pretty cold here and birds often can’t get fresh water in winter because it’s now ice. A supply of fresh water will be well received before it too freezes. We’re grateful to our birds for the enjoyment (and occasional thrill) we get from watching them. 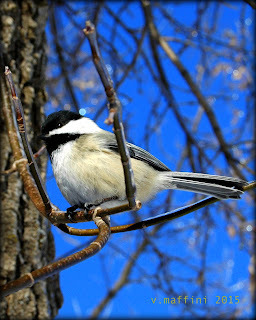 Thanks little nuthatches, wrens, sparrows, cardinals, jays, finches – yellow and purple, chickadees, juncos, robins. Those of you who winter over spread a lot of joy. 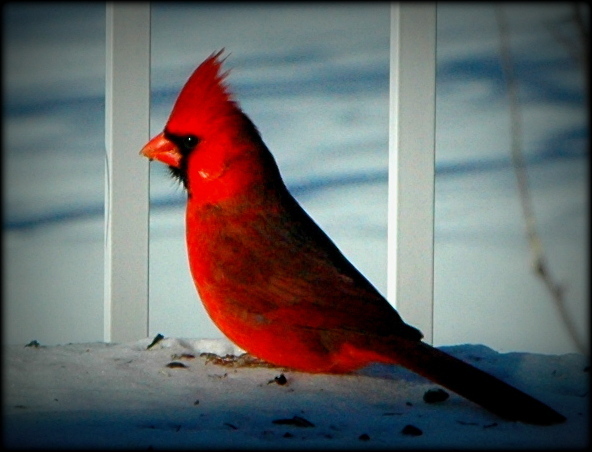 Nothing beats the thrill of seeing Mr. Cardinal against the bright white snow. 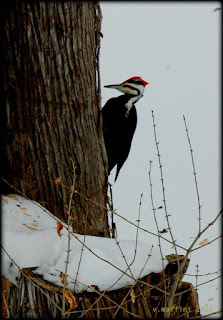 What kind of birds will you see from December to April? I hope you California types will chime in too! If you have any tips about birds, bird feeding or have any stories to share, please let’s hear them.